You run a website. Perhaps you hired a bad SEO in the past, or you yourself have done some questionable link-building at some point or another. You fear you might get hit (or already have been hit) by Google’s Penguin algorithm. Don’t fear. Google’s Disavow Tool is here, and I’m here to tell you how to use it. In this post you’ll find step-by-step instructions on how to use this tool and some background on why you should (or shouldn’t) be disavowing. First, for those that don’t know, Google’s Disavow Tool is basically a way for you to tell Google “I don’t know that guy”, prompting Google to ignore certain links pointing to your site that it finds when crawling, and (ideally) not hit you with a penalty. Second, it’s important to understand the gravity of what you’re doing before you start disavowing links left and right. The links coming to your website are an important signal (check out Pagerank) of how useful your site might be to users. If you have high quality links from credible websites, you REALLY DON’T WANT TO DISAVOW THESE LINKS. The only links you should be disavowing are those that are potentially harmful to be associated with online. That being said, you can always make adjustments to your disavow file. A link can be un-disavowed, although this will not happen immediately. Third, nobody (besides Google) really knows the exact implications of submitting a disavow file. Some people say it doesn’t do anything, some swear by it. Fourth, after you upload your disavow file, keep it. You’ll want to add to it (as opposed to replacing it) as more questionable links show up down the road. Fifth, a link can be both potentially harmful AND helping you in rankings. It’s a fine line. Some links Google might not have identified as dubious, but they will, and when they do, you get hit with a penalty. It’s smart to preemptively disavow links you know to be potentially harmful now, and get busy building links to replace these with credible sites. That being said, let’s get started, shall we? Step 1. Identify Offending Links. This is the hardest part. For more on this, check out my other blog post. To summarize, your goal is to identify the links that Google will perceive as dubious. What links does Google perceive as dubious? Those that are trying to trick it. If a link doesn’t exist to serve a purpose for the user, that’s a bad start. If a link exists because there was money or links exchanged to get it, now we’re in trouble. 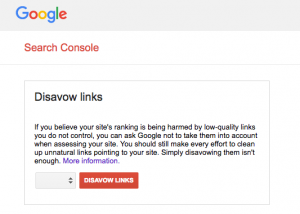 Google provides a set of guidelines to make this process of choosing links to disavow easier. Run through and compile these dubious links into an excel spreadsheet. Google recommends reaching out to each site you no longer want linked to you and personally requesting that they remove the link in question. You can do this by visiting the site and looking for an email address or filling out a comment box. As you can imagine, this can be a tedious process. Send out your requests, then wait a week. Keep notes of which sites you contact, and which sites respond/remove links. Remove the links that webmasters have taken down from your spreadsheet. For the (many) links that remain, it’s time to disavow. 1. Your disavow file must be a .txt file (At mockingbird we like to use Sublime Text, which automatically saves as a .txt file. This makes adding notes later on easier, and it’s free). To follow each of these rules, I copy and paste my links for disavow from excel into Sublime Text. You can, however, just save your excel spreadsheet as a .txt file. These notes (following the “#”) are purely for personal use. They’ll come in handy when you’re adding to this list later. Make sure you are logged into the correct Google Search Console Account. (if you have multiple) Select the website you wish to disavow links to. Bingo. You’ve submitted your disavow file. Give Google some time to recrawl your site, generally a number of weeks.